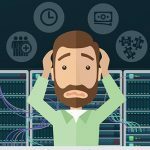 If you’re interested enough in this topic, you’re probably savvy enough to know that collecting and analyzing events is your information superhighway to understanding how your users interact with your application. But let’s back up just a second and ask the question that this idea is predicated upon: Why do we collect events in the first place? 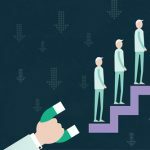 Past iterations of business intelligence professionals would have inferred quite a bit from demographic and psychographic information collected about their users at various stages in the buying process. It’s easy to say that people from the United States tend to purchase more than those in other countries and that younger people tend to have a higher proclivity to shopping online. But demographics and psychographics won’t tell you everything. Studies show that behavioral data about users is strikingly better for predicting things like purchases, upgrades, and churn. This philosophy not only binds our company together, but it permeates through our product and guides every design decision we make. Cooladata is an entire system designed to enable swift analysis and understanding of user behavior. In this universe of user behavior, events are the atoms. When a user takes some kind of measurable action on your website, in your application, or within one of your digital assets, that action is recorded as an event. Event data modeling is the process of using business logic to store event-level data to produce data that is “analyzable,” meaning simpler to query and understand user behavior. Add Item event : Product, Price, Color, Size, etc. Checkout event : Total price, Discount, Shipping Option, etc. Traditional BI data models such as star schema or snowflake contain fact tables and dimensions with a fixed structure. This is efficient and easy to use for analyzing data, but it only works on data which is structured and the schema doesn’t change much. DUA: device user agent contains many attributes about session, such as device, browser, OS, location, etc. The event data structure also tends to change very frequently. This means you would have to add fields and tables on an almost daily basis. The data structures tend to change quickly due to the rapidly evolving nature of businesses today (versus 20 years ago). 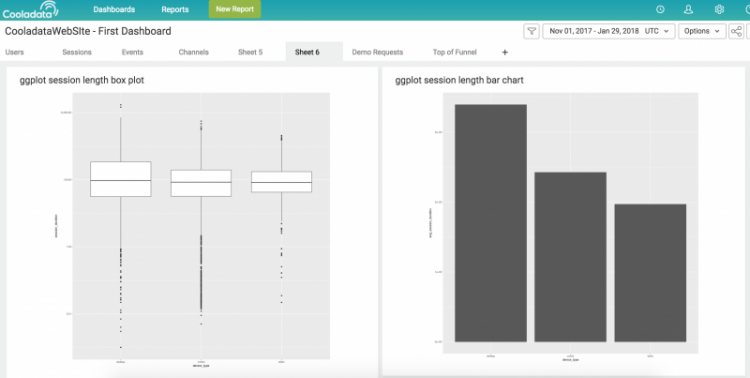 With a new product feature, new tool, or new release you’ll find yourself needing an event-based data model that is flexible, scalable, and can easily incorporate new events. Rigid models such as snowflake or star schema simply aren’t good at adapting to the rapidly changing nature of 21st-century businesses. 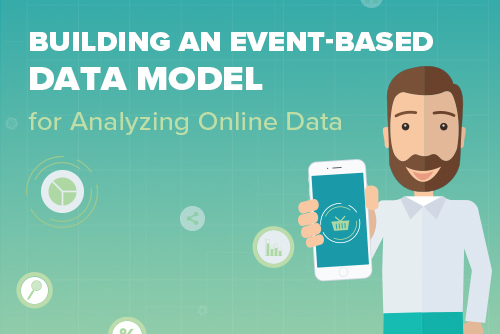 There are several ways of building event-based data models. Below, we’ve listed 3 of the most popular, as well as our own version. Before we get started, let’s look at some of the most important considerations for an event-based data model. Now let’s take a closer look at some of your options. Good performance for specific behavioral queries. For example: Funnel analysis will create a join between the event-type tables which is much more efficient than creating join on the all the events using subquery for each event type. Optimized for analyzing specific event type. You can still analyze all events with common attributes using “All events” fact table. Difficult to manage, especially in dynamic environment. Whenever you add an event type, you need to add a table reflecting on ETL and metadata and monitoring. Each event type requires a new table. Even if this event type is very seldomly used, you will need to maintain a table for each event type. When you have hundreds of event types this becomes unmanageable. By having an “all_event” table and an “event_type” table, you are replicating data. This requires a lot more work and can easily lose sync resulting in data quality issues. Easier to manage than a table for each event. New attributes are just added to the JSON field and there’s no need to manage many event_type tables. Easy to analyze common event attributes. For example: Event time stamp, user_id, session_id, etc. Difficult to analyze the custom attributes. You need to extract the custom attribute from the JSON field for each query resulting in slow performance. 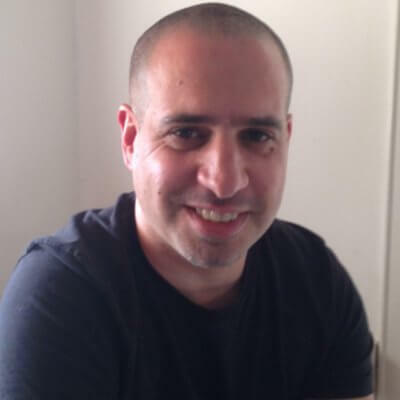 For example: In Google BigQuery, selecting a small amount of data from a larger JSON object is more costly due to the BigQuery pricing being based on scan size (bytes processed). Difficult to map metadata and use BI tools for the custom attributes, since data can be in a nested JSON string. Elegant and easy to understand the way data is stored. Flexible in attributes for each hierarchy. Good performance for certain queries such as count distinct. Certain queries such as count distinct will scan much less data. 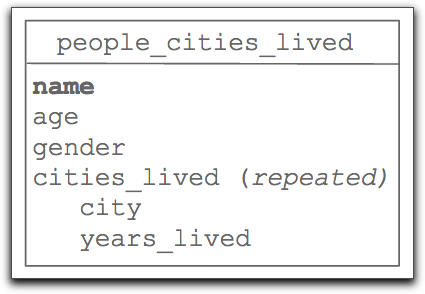 All data is contained within a single table, reducing the requirement for joins between tables. Nested data become difficult to query easily. Difficult to load data into the tables, especially incremental data. Difficult to map metadata and use BI tools over a nested data model. 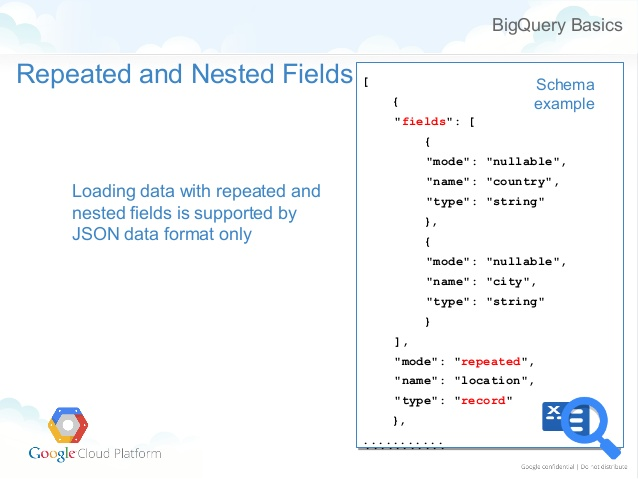 Columns containing nested data require reasonably complex defined schemas to account for possible self-describing JSON events that may occur in these columns. Almost Impossible to update data. There is an option to store specific event types into different tables. Easy to understand the way data is stored. By storing popular event types in separate tables you get the optimal cost performance. All loading of the data is handled by Cooladata. You are able to analyze the data very easily. You have easy access to historical changes (slowly changing dimension). 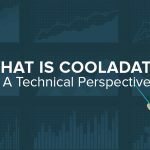 For optimal performance you need to use CQL (Cooladata SQL). Data management is via Cooladata. We partition data by time and property, such as event type, geography, etc. to get maximum performance and optimize data access. We store the data on a sparse columnar analytical database, getting both flexibility and performance. We automatically create the semantic layer and metadata data from online data, as well as traditional data. Our intelligent parser translates simple SQL statements to be able to access the relevant partitions. 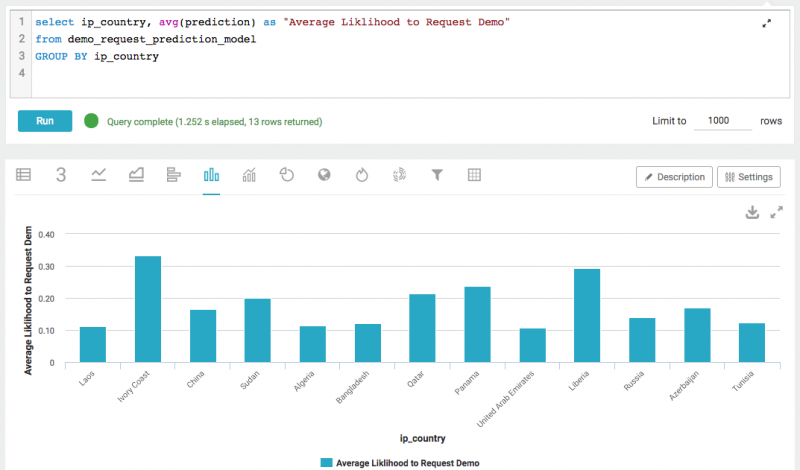 We extend SQL, which is set-based with more functions, enabling time series analysis over granular data. Combines transactional & online-based data to one coherent flow. Flexibility of a document-based schema in the data model. Comprehensive dimensional and time series analyses in one schema. Ability to use common visualization tools on top of data model. Ad hoc unification online and traditional data. Optimize data cost by smart partitioning. Full track of historical data changes (slowly changing dimensions).